I made this set for someone for their 40th anniversary. The reason the sentiment on the card is “sweet, sweet moments” is because one of the spouses has passed away, and this was for the surviving spouse. We wanted to commemorate the anniversary with a gift and a card, but “Happy anniversary!” didn’t really seem appropriate. I was going to use “Thinking of you”, but I had the Happy Day stamp set out so I could use that beautiful medallion, and when I noticed the “sweet, sweet moments” sentiment, it seemed like the perfect thing to use. The 40th anniversary is traditionally the ruby anniversary, so I decided to make the card and wrapping mainly in Real Red. I actually wrapped the gift first and then made the card to match, instead of the other way around. 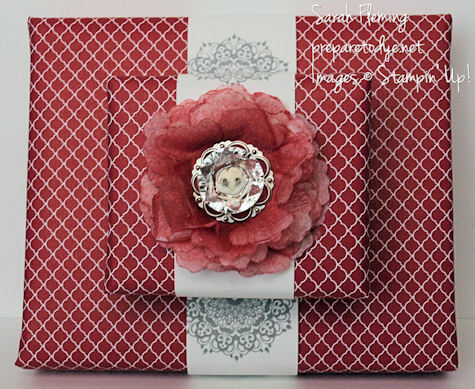 I used the Real Red fan pattern from the Brights Designer Series Paper stack to wrap the gifts. I stamped the medallions on the Whisper White bands (not very well – I should have centered the medallions! I don’t know what I was thinking) in Smoky Slate ink. 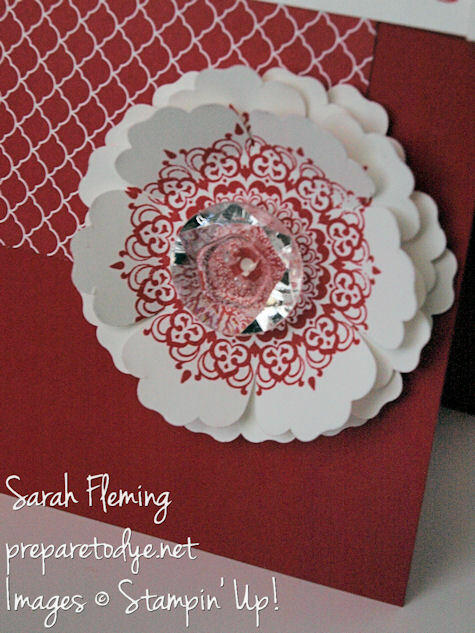 There are a number of ways to make these beautiful little creped paper flowers. I used the Blossom punch to punch out eight flowers from the Creped Filter Paper, then sponged Real Red ink on each one. The paper is a little strong for poking a brad through, so I punched a 1/16″ hole in the middle of each flower, then attached the eight flowers together using the Antique Builder Brad (retired). I attached the Vintage Faceted Designer button to the brad using Glue Dots, for extra elegance and sparkle. Then I bunched up each layer of the flower to give it extra 3D volume. I made the card using only Real Red and Whisper White, again to symbolize the ruby anniversary. I used the same designer series paper and the same medallion stamp, only this time I used Real Red ink for the medallion. 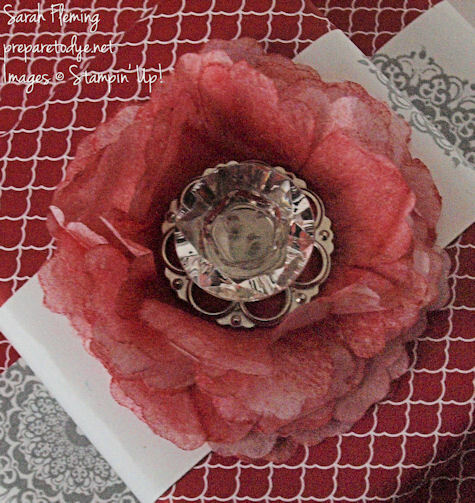 I stamped the medallion five times, then punched out the flowers, centering the medallion in the Blossom punch each time. So each layer of the flower is stamped. After I put all the flowers together with my tape runner, I folded up each petal of each flower, then attached the button using Glue Dots. After I stamped and cut out the sentiment, I curled the ends of the paper. I kept looking for a small tool to curl the ends around (and didn’t think of my paper piercing tool until just now! ), so I just kind of rolled it with my hands. I think the piercing tool would have done a better job. This was an easy wrapping job with an easy card to match. I also stamped a red medallion on my envelope. Red, red, red. You can buy all the products (except the brads) to make this beautiful gift set in my Stampin’ Up! store. There are only four days left to get your Paper Pumpkin subscription for half off for the first two months! If you subscribe by August 31, your first two months are only $10 (includes shipping)! The first month, you receive the Welcome Kit, which includes Clear Block D (an $8.50 value), so make sure you sign up for this great deal today! You may cancel or skip a month at any time.